If you’ve managed to master how to deal with a potential landlord, sort out water issues, and figure out how you should be charged for electricity, the worst is not behind you. Now, there’s furniture to be taken care of. We present our list of furniture markets in Delhi for those on a budget. Whether you’re shopping for an office, restaurant, bedroom, or any space, head to one of these furniture markets that’ll offer more than one thrifty ways to do up a space. Asia’s largest furniture market, Kirti Nagar houses over 500 furniture wholesalers and retailers, interior design boutiques, kitchen and bathroom brands, and traditional furniture makers. You can even have them copy furniture to suit your budget or a particular theme. Office, restaurant, commercial space, house, bedroom, kitchen – Kirti Nagar will have furniture for all the spaces. Have a look at what we found in this market here. Located close to the DLF City Court, this market stocks up on antique-looking wooden furniture, cushioned swinging chairs, cane furniture, mudas and everything you’d need to create a home with eclectic pieces. We even found a rustic looking blue wooden night stand we’d decorate an entire room around. Find more here. 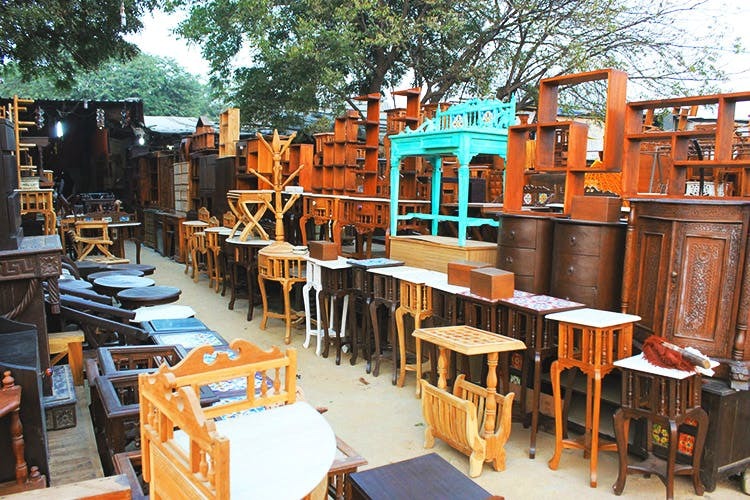 On the road that connects Connaught Place to Jhandewalan, or more specifically from RK Ashram Marg metro to Rajiv Chowk, you’ll find a cramped and confusing furniture market. Stay patient—this is one of Delhi’s foremost furniture store streets for good-quality but cheap furniture. We found Rajasthani hand-painted tables, wooden engraved dividers and comfy chairs you’d want to habitate in. Don’t believe us? Check this out. On the two-kilometre stretch starting from Hari Nagar to Tilak Nagar, Jail Road Market is the lesser known furniture hub that’s probably the least confusing market with most of the furniture shops lined one after another on the main road. You’ll find simple furniture here which will definitely fit your budget, plus there are many stores selling curtains, drapes, mattresses, and artifacts too, so you can get a lot sorted for your home in just one trip. This place is great for people who’re looking for simple wooden or cane furniture that doesn’t cost a bomb. You can find a single bed here for as cheap as INR 3,000 and a chair for INR 1,500. These won’t be the fanciest furniture, but they’ll get the job done. Across and down the road from Tivoli, behind the gate neighbouring Oodles Hotel, you will be greeted by the crew at Sharma Farms. A smidge spooky and cut-off, this place requires a dose of patience when you visit, given the amount of scouring you’ll have to do. Inundated with furniture (each and every kind) and ranging across types, you can expect vintage, restored, Indian-inspired, cut-out work, temple inspired pillars, statues, sculptures, wine holders, doors, panels, and figurines here. They’re cheaper than most of their competitors, but this place requires you to bring your bargaining A-game. Open seven days (10am – 6pm). We wish we could give you an address, but these savvy wheeler dealers enjoy the ‘now you see me’ game. If you do happen to find them, they’re spread over one particular street, interspersed between basements and the road side, and retail second-hand, over-used, and vintage furniture—everything from tables and chairs, to bookshelves and colonial style furniture. Bargain, and point out glaring wear & tear to score a discount. They can also assist with a quick paint job, or a fix-me-up. Between Arjan Garh and Ghitorni metro station, there are shops selling cane furniture, chiks and different kinds of chairs. A store called Village Article here sells bean bags for as low as INR 500. Laundry baskets, hanging lights, mudas and hanging lights made from colourful rope are some other stunning pieces we found at this mini market. Here’s a list of all the shops that you need to check out.